Delhi, the capital city of India is one of the most fantastic metropolitan cities to live in that has the best of both worlds. With numerous heritage sites, such as the beautiful Red Fort, Jama Masjid, Qutub Minar, etc. and the fast moving city life parallel to each other, living in Delhi can never get boring. But every once in a while, it is only natural to want to explore more than what's in the city. Thankfully for the folks of Delhi, the city is surrounded with many places to see. One such place is Shekhawati in Rajasthan. Situated in the north of Rajasthan, Shekhawati is a semi-arid historical region. Formerly, Shekhawati was known as Matsya Kingdom and the region extended all the way to the river Saraswati. It used to be the biggest Nizamat state of Jaipur with Amarsar as its capital. Shekhawati is located 260 km from Delhi which takes about 5 hours to reach, perfect for a weekend. By Air: The nearest airbase to Shekhawati is Jaipur International Airport. It is located about 150 km away; taxis are available in the airport to Shekhawati. By Train: The closest railhead is located in Jhunjhunu. This railway station lies on the broad gauge line connecting Mumbai to Delhi. Therefore, it is well connected to many cities like Delhi, Gurgaon, etc. By Road: Private buses and public transport by the state government is available to travel in and around Shekhawati. It is also well connected by road so one can also hire a taxi to reach Shekhawati. Neemrana is an ancient city in Rajasthan that is fondly known as the Golden Triangle due to its equidistance from the three major cities of Agra, Jaipur and Delhi. The main attraction of this town is the magnificent Neemrana Fort Palace. 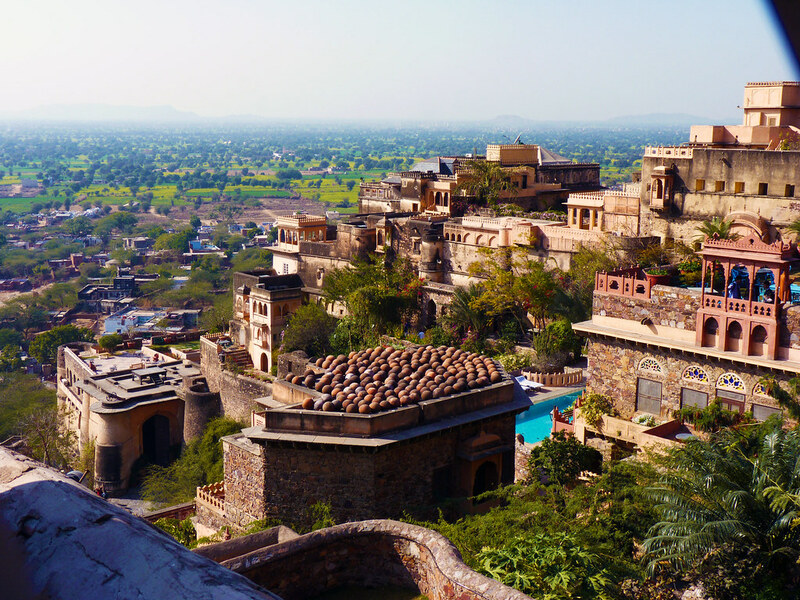 The fort palace is nestled in the Aravalli ranges at a beautiful altitude. It has now been turned into a magnificent luxury hotel, where you can stay for a day or two and live the royal life of a bygone era. Some places that you can visit in Neemrana apart from the palace include Sariska National Park, Bala Quila, etc. Read on to know about the places to visit at Shekhawati. Under the supervision of Rao Bishan Singh in the early 18th century, Shahpura Haveli was beautified into the gorgeous palace that the place now has been turned into. You can find stunning floral, hand-painted work of art in the Darbar Hall, photographs of Rao Bishan Singh and his family and the absolute grandeur of the palace. Shahpura Haveli has also been turned into an extravagant luxury hotel, where you may live a royal life since the palace has only been enhanced and not changed from its 18th century form. By now it is quite obvious that architecture is paramount in Shekhawati. Frescos was something introduced first by the Shekhawat Rajputs in the town and has one of the largest concentrations of frescos in the world. Painted havelis are the main attraction of the place apart from frescos. Many of these havelis have now been turned into luxury hotels. Some forts and castles that you can explore in Shekhawati include Mandawa Fort, Mukundgarh Fort, Arooka Castle, Tamkor Fort, to name a few. 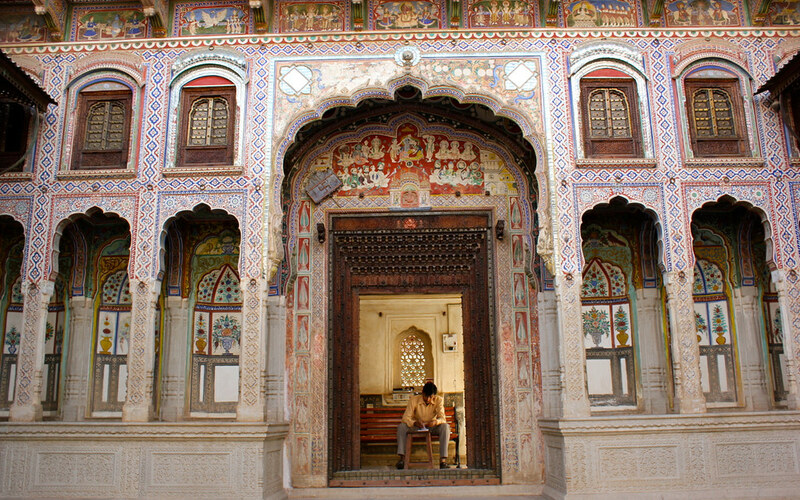 Plan a heritage walk through the streets of Shekhawati.